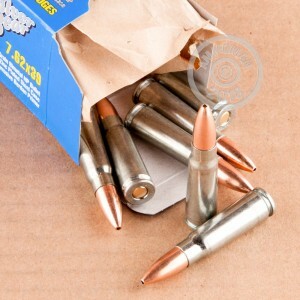 The 7.62x39mm is one of most iconic rounds in the world. Used all over the globe in the AK and SKS series of firearms, whether they be Russian-made or otherwise, this round has proven itself to be among the most effective in the world. Whether you are looking to plink around, compete in a match, hunt, or defend your family, the performance of the 7.62x39mm completes your every need. Silver Bear is one of Russia's premier ammunition companies. 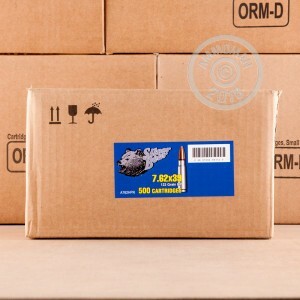 Deriving their name from their zinc-plated steel casings, this company gives you high quality, smooth feeding, and inexpensive ammo that perfect for range training or other uses. 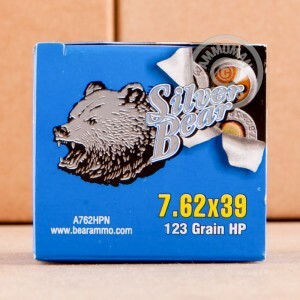 This 123-grain, Berdan primed, hollow point ammo is great for range training but also offers massive expansion for self-defense or hunting thin-skinned game. Shot at a 12 inch target at 300 yards with an Arsenal Sam61. 9 shots 9 hits in a 6 inch group. That will do me.